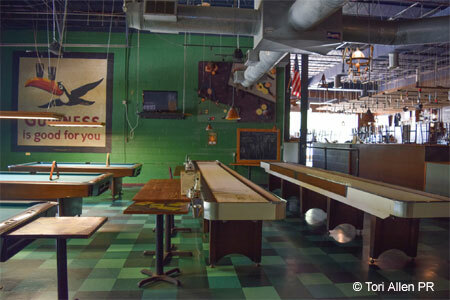 Established in 1996, Twain's has worked as a brewery, a restaurant and a billiard parlor. : Famous foodie Mark Twain lends his name to this popular neighborhood watering hole. Impressions of pages from his work line one of the walls, while wooden pub tables and a large bar define the space. Odd free-form objects festoon the ceilings, and Twain's image, etched on the front doors, is bolstered by some of his pithy sayings posted among other objects. Eleven regulation pool tables draw avid participants, plus there are TVs for watching games. First-rate house-made brews share billing with a good list of other beers, both by the bottle and on tap, and a reasonably decent, if short, wine list. Twain’s offers a burger made from naturally raised Brasstown beef from North Carolina, plus a chicken burger. Among several vegetarian options, go for the chili. We also like the fish ‘n’ chips, the fish lightly battered and the chips hot and crispy, as are the onion rings available as a side. Wings are a good place to start, especially for something to share. At brunch, plop a pair of poached eggs atop the pastrami hash. Dessert is a frequently changing affair, but anything with chocolate will be irresistible. Twain's welcomes families until 9 p.m., when it's then 21 and up.